Everybody goes to Morocco- at lease everyone in my world of travel blogging. I’ve never been to Morocco and I’m DYING to go, its on the top of my list. I was planning a trip to Morocco this past October and changed my mind…I chose to travel to Tunisia instead. I hadn’t seen anyone I know travel there before, therefore I was interested in it. I was in Italy for two weeks and ended my trip in Sicily, which is just a short one hour flight into Tunis. I decided to spend 3 nights in Tunis, and 5 nights in Hammamet, Tunisia. I really didn’t know what to expect but I was curious about the culture and excited to learn about it. I found the people to be warm and genuine, and overall I felt good vibes everywhere I went. Tunisia is a Muslim country in Northern Africa bordering the Mediterranean sea and the Sahara Desert. They speak Arabic and French. I recently got the new EOS R camera from Canon and was eager to shoot with it in Tunisia. I decided I wanted to shoot local people living their everyday life- I posted a few on my Instagram but excited to share a few more with you below. I really enjoyed my experience in Tunisia. I got many questions on my Instagram from solo female travelers asking if I felt safe there and if I would recommend traveling there alone as a woman. Would I personally travel there alone? No. I don’t prefer traveling anywhere alone in the world no matter where, but that’s just me. To answer the question if I felt safe- I wasn’t alone in Tunisia but I think regardless it felt pretty safe for the most part. You have to be aware and cautious everywhere you go in the world we live in these days. I definitely plan to visit again and want to explore southern Tunisia + the Sahara desert which I didn’t get the chance to do this time around. Below is a breakdown of a recommended itinerary for Tunis and Hammamet. Also to see a glimpse of a behind the scenes look, visit my Instagram and click on the Tunisia highlight on my profile! Bardo Museum- One of the most important museums in the Mediterranean region and 2nd on the African continent (after Egyptian museum of Cairo). Largest collections of Roman mosaics in the world, and a wide variety of archeological artifacts thousands of years old and over several civilizations. Sidi Bou Said- A beautiful blue and white town located 20km from Tunis. Must visit! Carthage Roman Ruins- The capital city of the ancient Carthaginian civilization. An archeological site of Roman ruins rich in history and an absolute must visit in Tunis. FOUR SEASONS TUNIS- There is no place better to stay then FOUR SEASONS TUNIS. I was blown away by this hotel. I’ve stayed at several Four Seasons around the world and this property is one of my absolute favorites. Having only been open for around a year, it’s impeccable and in pristine condition. The well-trained staff was friendly and so helpful and attentive to your needs. My room was beautiful with an ocean-view balcony, and the spacious all-white marble bathroom- I died! It was so stunning. The spa was one of the most gorgeous I have ever seen, as well as the pool. The Four Seasons Sunday brunch is my favorite brunch in the world and I was lucky enough to be there on a Sunday to experience it! It had limitless options and stations of different cuisines to choose from. We ate at the Creek Bistro for dinner 2 nights in a row because it was that good. Executive Chef of FS Tunis, Omar Mosquera Mallen, spoiled us with his best dishes on the menu and we were blown away by our meal experience. Every dish was extraordinary. The menu is tapa style, inspired by a fusion of Spanish, Mediterranean, French and Italian cuisine. Below are a few dishes I thought were outstanding. Hammamet is a resort beach town approx. an hour from Tunis. Most tourists travel to Hammamet for a relaxing beach getaway. Nabeul- loved visiting the Medina in Nabeul. Nabeul is also known for pottery, and you can see many pottery shops and workers molding and painting the ceramics. Spend the day on the beach! LA BADIRA– I stayed at La Badira my first two nights in Hammamet, an adult only 5-star hotel located right on the beach. “Badira” means luminous as the full moon and uses the principle of light as the inspiration for the theme and architecture of the hotel. It’s modern elegance and white decor really comes into play at night when everything is illuminated. We spent a day by the pool and beach, and at night relaxed in the all white rooftop open air lounge and enjoyed Tunisian mint tea. The sunsets at La Badira were breathtaking and it was the perfect place for rest and relaxation. HASDRUBAL THALASSA & SPA HAMMAMET– My last 3 nights in Tunisia were spent at Hasdrubal Hammamet. A grand resort located on a private beach, Hasdrubal is known for their extravagant spa and treatments as well as salt water pools. The resort was so welcoming upon my arrival and really went out of their way to make my stay extra special. I really spent most of my time relaxing and enjoying the resorts amenities. I indulged in a wonderful spa session with a Turkish hammam (Turkish bath) and a massage. I stayed in a very spacious and luxurious suite with a beautiful view of the pool and property, and our balcony was an epic spot to watch the sunsets. I ate most of the meals at the resort as well. The food was excellent and had a ton of variety to choose from. 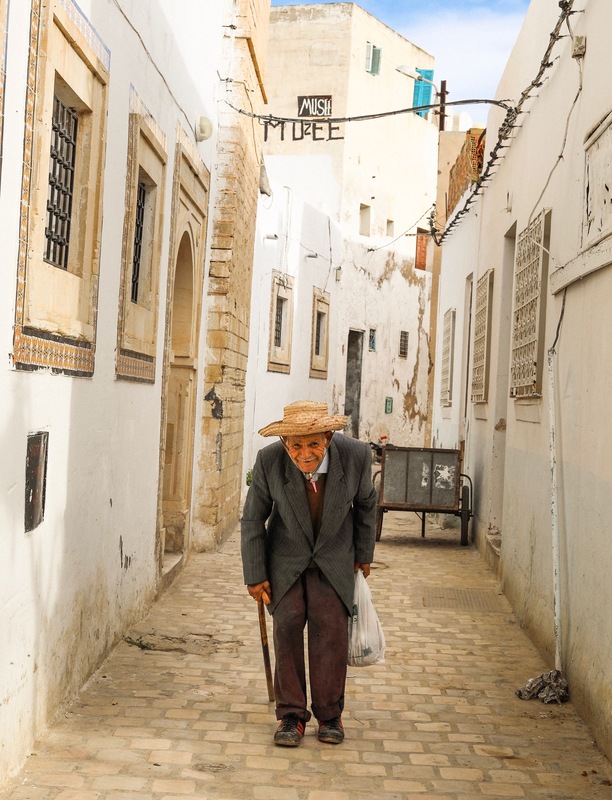 I wanted to venture out one day and the resort planned a whole day excursion with a driver and guide to visit the Medina of Nabeul and Hammamet. It was one of my favorite days in Tunisia and I learned so much about Hammamet and the city of Nabeul. One of the other highlights was listening to a Tunisian musician at night in their beautiful tea room and smoking hookah (Shisha in Tunisia). Unbelievably beautiful photos! Thank you for showing the world how beautiful their backyard truly is and also reminding us to follow our individual happiness! Your blog gives me the motivation to travel and explore! The pictures are breathtaking, I feel like I’m there. Planning on going to Tunisia for 3-4 days this summer. Did you prefer staying in the Tunis or Hammamet area?